This "Historically Speaking" column appeared in the Exeter News-Letter on Friday, November 22, 2013. Fifty years ago the nation reeled from the news that President John F. Kennedy had been assassinated in Dallas. The first news that something had happened trickled into town just before 2:00pm Eastern time and by 2:30, the official announcement of the president’s death arrived. People heard the news on radio or television and word quickly spread. The weekend that followed, unseasonably warm in Exeter, has been described as one of suspended animation by most people who remember it. Kennedy was a familiar figure to most of the town’s citizens. He had visited the town in 1956 while on a campaign tour for the Democratic Party. Senator Kennedy had just lost a bid for vice-president at the Democratic Convention during the summer and by September, when he came to Exeter, he was stumping for party votes. His speech at the bandstand, which began an hour late due to delays earlier in the day in Manchester, was well received by the local Democratic Party members. But the Republican Party was still dominant in town and the crowd, although polite, was probably not won over by his speech. The Exeter News-Letter, in its coverage of the event, noted of his convention loss, “Many attribute his defeat to his courageous Senate vote in support of the Republican administration’s flexible farm price program in defiance of the Democrat Party stand for firm 90 percent parity prices.” It would seem that the most complimentary thing to say about a Democrat in Exeter was that he voted against his own party. When the election of 1960 rolled around the News-Letter endorsed Richard Nixon. “As New Hampshire people living under the aegis of the state motto ‘Live Free or Die,’ we strongly oppose any further retreat under the umbrella of welfarism. It is time to restore the attitudes of thrift, self-discipline and morality to the national character. Some Democrats by their voting records indicate they believe in these principles, but Senator Kennedy is notably absent from the list.” The election results indicate that a majority of the town agreed with the paper. Turnout that year was high; 3,747 voters cast ballots and Nixon soundly won the town with 2,273 of those votes. Republicans won the entire ticket in Exeter and Nixon received all of New Hampshire’s electoral votes. Exeter in 1963 was still relatively small. The 1960 census estimated the town’s population to be 7,243 persons, or roughly half of what it is today. The Ioka Theater was the center of entertainment, although many people now owned television sets. For the week of November 20th, the big draw was a Disney film called “The Incredible Journey.” Exeter High School students were performing “Pride and Prejudice” on Thursday and Friday. The Thursday show was a great success, but Friday, with news of the assassination, the performance was postponed until the following week. Various civic and fraternal groups scrambled to respond to the tragedy. Chief Ranger Walter Gadd, of the Foresters of America, called an emergency meeting of the officers and planned a memorial service. They also decided to drape the Court Charter for 30 days – a tradition that was usually reserved for members only. After President Johnson declared Monday, November 25th a day of mourning, many more postponements and services were planned. The High School trip to New York City that was scheduled to leave on Monday was moved to December. All town schools were closed on Monday – the students had a very short week given that the end of the week was Thanksgiving Break. St Michael Church held a special Mass on Monday at 10:00 that was attended by over 800 people. Thirty days of mourning followed and there was no small amount of hand-wringing about the safety precautions that were overlooked in Dallas. “It is our belief that United States Presidents have always exposed themselves unnecessarily. Unfortunately our political system calls for their exposure to tremendous crowds. Somehow, the goings and comings of these eminent persons must not be publicized,” opined the Exeter News-Letter. But the wounds were deep. There were few around who could remember the assassination of President McKinley in 1901, which was also attributed to a President unnecessarily exposing himself to public crowds. In the end, the News-Letter lamented, “a man who is President of the United States is something special. His ‘family’ transcends the relationship of blood and heredity. 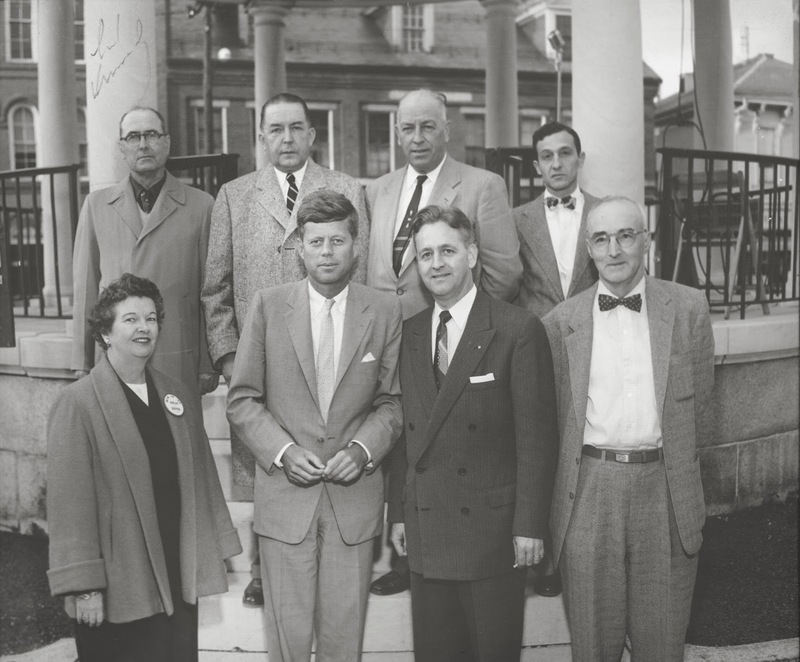 As the elected leader of 180 million Americans, this personage has the awesome duty of promoting the welfare of each and every one of us.” He may not have been Exeter’s candidate, but John F. Kennedy was their President and the sudden loss touched everyone. 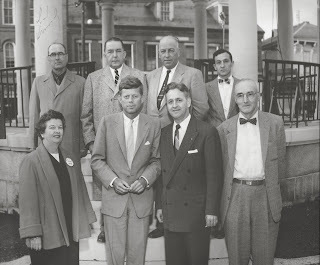 Photo: Senator John F. Kennedy visited Exeter on September 25th, 1956 while campaigning for the Democratic Party. He spoke for just under an hour at the Swasey Bandstand in the downtown. Pictured with the Senator are: Frances Smith Adams, John Sullivan, John Cahill (back row) Walter Driscoll, Thomas Fecteau, Lawrence Pickett and John Lusona. Ben Swiezynski, a local photographer, took the picture.